Mets first baseman Ike Davis has seen the number of fastballs thrown to him drop significantly since his rookie season in 2010. In that year, 57% of the pitches thrown to Davis were some type of fastball. So far in 2012? Only 51%. There have been only 30 seasons between 2007 and 2011 where a hitter with more than 100 plate appearances saw a lower percentage of fastballs in a season than Ike this year — and only five where a player accumulated more than 500 plate appearances. Clearly pitchers are adjusting to Davis, altering their approach based upon Davis’ perceived offensive strengths and weaknesses. This got me thinking about the extent to which major league pitchers adjust to hitters from year to year. Was this change significant, or more common based on the normal adjustments hitters can expect to see from year to year. Outside of sliders, non-rookies showed a higher correlation between the off-speed pitches they faced between years one and two. Sliders were highly correlated for rookies between years one and two (.726); the relationship between year one sliders and year three sliders for non-rookies was nearly identical (.669 vs. .660). Curveballs were inconsistent regardless of hitter type. Rookies also saw their year-three correlations increase for both curves and changeups, versus year-two. Both were higher than non-rookies. As with fastballs, I wanted to see if the difference between the rookie and non-rookie correlations was significant. It was but only in the case of curveballs between years one and two (p-vale of .05). 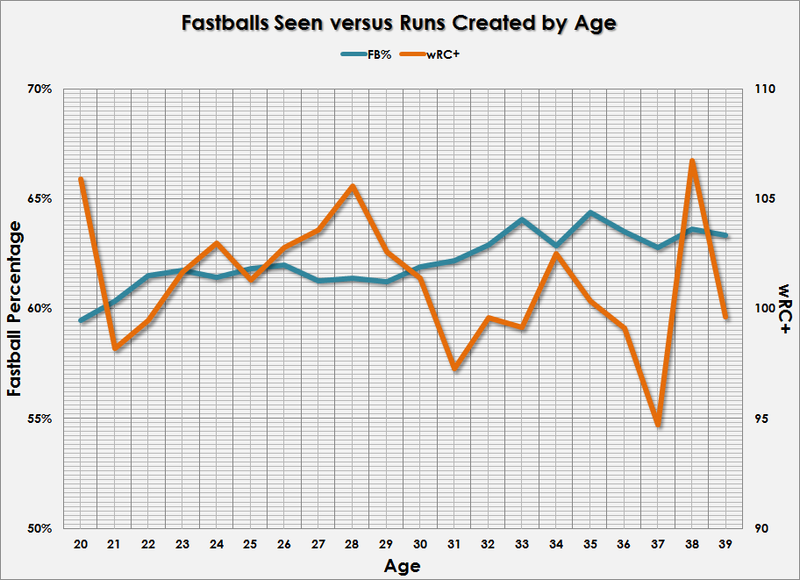 The percent of fastballs faced increases slightly until about age 26. Pitchers then throw hitters fewer fastballs until about age 30. The rate then increases dramatically as hitters age. If we think about a hitter’s productivity through time then this makes sense. Hitters who last until age 30 are likely better-than-average and will have hit their offensive peak during their age-25 through age-29 seasons. As these hitters begin to age, they’re likely losing bat speed and making pitchers throw them more fastballs. There are obviously exceptions, but the pattern passes the initial sniff test. The pattern resembles the story above. 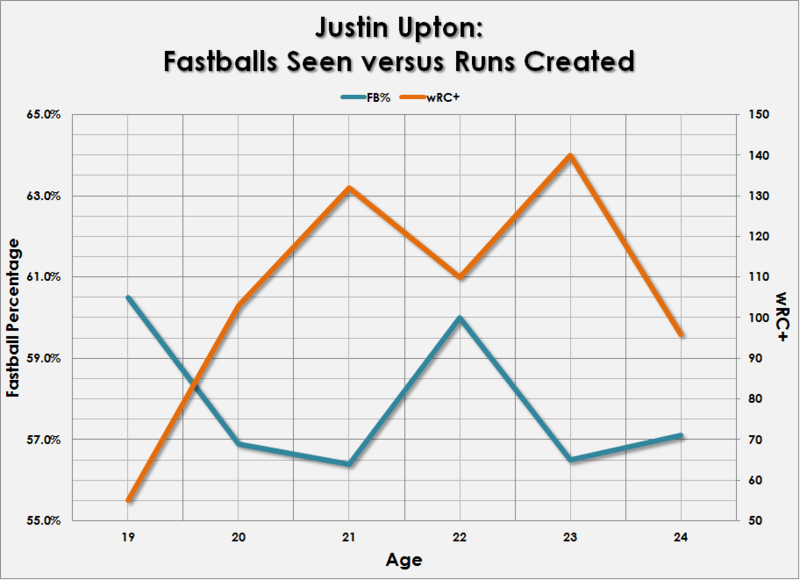 As Justin Upton entered his peak offensive year, he saw a decrease in the percentage of fastballs thrown to him. So far this season, he’s seen fewer fastballs — and while his wRC+ is currently below average, my guess is he’ll finish his age-27 season north of 100. So back to my original question about Ike Davis: Is the change in the percentage of fastballs he’s seeing that uncommon? The answer appears to be no. While the low rate of fastballs is rather unique, the way in which the league adjusted to him between years one, two and three is in line with what we see in general. Rookies see a higher correlation between their year-one and year-two fastballs and less of a correlation between years one and three. Davis’ percent of fastballs seen has been 56.8%, 56.7% and 51.4%. Also, the 5%+ decline in fastballs seen is far from an outlier, as there have been 69 seasons where hitters saw the same or greater decline in fastball percentage since 2007, not including Davis. Obviously, there is more to adjustments than pitch-type distributions. I’ll eventually get a chance to look at location and velocity, but if PITCHf/x and database-savvy readers want to tackle this, please jump in. We hoped you liked reading How the League Adjusts to Hitters Over Time by Bill Petti! SUPER interesting, Bill. Thanks for this.